Western blot analysis of extracts from HeLa cells synchronized at various stages of the cell cycle, using cdc2 (POH1) Mouse mAb. 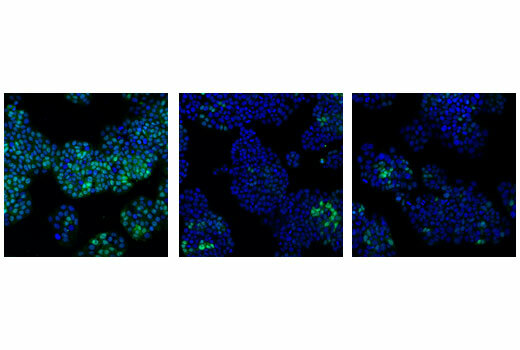 Confocal immunofluorescent analysis of HT-29 cells, transfected with SignalSilence® Control siRNA (Unconjugated) #6568 (left), SignalSilence® cdc2 siRNA I #3500 (center) or SignalSilence® cdc2 siRNA II #3600 (right), using cdc2 (POH1) Mouse mAb (green). Blue pseudocolor = DRAQ5® #4084 (fluorescent DNA dye). cdc2 (POH1) Mouse mAb detects endogenous levels of total cdc2 protein. The antibody does not cross-react with other cdks. Monoclonal antibody is produced by immunizing animals with a recombinant human cdc2 fusion protein. 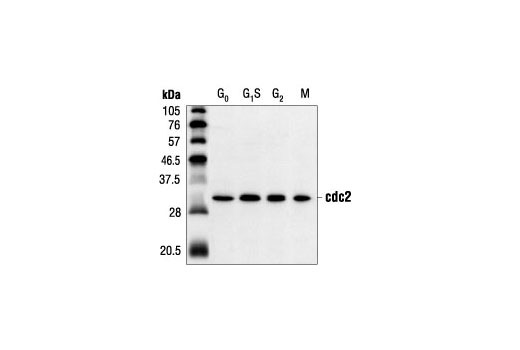 This antibody recognizes residues near the carboxy-terminus of human cdc2.